"It was something in the knee ligament. He was in pain, I had two midfielders on the bench so I made the change immediately," said Mourinho. "If you asked me, I would say I do not know if he will be fit for Wednesday's match against Reading." 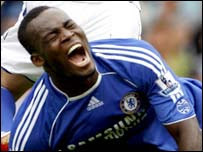 Jose might receive some help from Makele, who returned to training today, but Essien is so solid in the middle that his presence surely will be missed.